High Intradiscal pressures cause discs to bulge out and press painfully on nerve roots. They also make for a compressed, anaerobic environment unsuitable for healing. Non- Surgical Spinal decompression produces negative pressures within the disc which experts believe creates a vacuum effect that draws in nutrients and fluids to promote the repair of injured discs and surrounding tissues. This vacuum has also been shown to aid in the retraction of escaped cushioning gel from herniated discs. Much like gauging the air pressure in a car tire, scientists have been able to use pressure sensors to measure the various pressures put on spinal discs while lifting, standing, sitting, lying down, undergoing traction, and during VAX-D Therapy. Like other pressures found in the body such as blood pressure, intradiscal pressure is measured in millimeters of mercury (mmHg). While traction, physical therapy and chiropractic manipulation may reduce disc pressures to as low as 40 mmHg, only VAX-D has been shown to achieve negative pressures within the spine. Clinical studies have shown that, with VAX-D Therapy, negative pressures as low as -160 mmHg are created within the injured disc during the treatment session! With traction, weights are added one by one to the end of the traction bed which, in turn, adds tension to a harness secured around the patients pelvis, lengthening the spine. The intention is to relieve pressure, but the linear force of this traction can produce spasming which may lead to greater injury. Studies confirm that the benefits of traction come from simply immobilizing the spine. In fact, the Quebec Task Force ruled in 1996 that traction was not an effective treatment for chronic herniated discs. The results are not long-standing and cannot produce negative pressures in the disc. Non- Surgical Spinal Decompression also lengthens the spine, but the approach is far different, and that makes all the difference. Normally, pulls exerted on the spine trigger sensory receptors in the back to tighten the muscles surrounding the vertebrae and discs in an effort to protect them from injury- a mechanism in the body known as the propioceptor response. VAX-D Therapy is able to detect, then bypass this response through a motion-controlled biofeedback system which then allows the back to relax completely. With the body's natural protective mechanism at bay, VAXD can administer tension without causing injury. VAX-D achieves spinal decompression through an intricately timed series of pulls, holds, and releases administered over a period of up to 45 minutes, as determined by your physician. 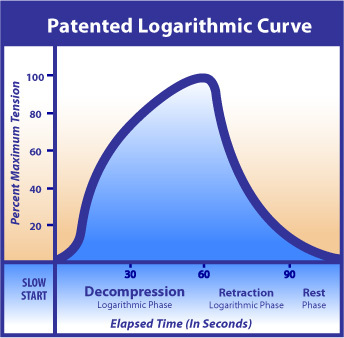 Tension moves along the logarithmic curve, shown below, slowly ramping up, holding, then decreasing. VAXD's biofeedback system adjusts this curve of tension specifically to each patient's needs, making every session a truly individualized treatment. VAX-D Therapy involves three phases that repeat up to fifteen times throughout a treatment session- the Decompression Phase, the Retraction Phase, and finally, the Rest Phase. During the Decompression Phase, tension slowly mounts, lengthening the spine; up to 99 pounds of tension may be exerted directly on the injured discs. This is where spinal pressures drop and spinal decompression actually occurs. During the Retraction Phase, tension is slowly decreased and the spine is retracted slowly. This is followed by a short Rest Phase.